1. According to the pump’s abundance allowance calculation, to ensure that the pump does not occur cavitation. 2. For submersible pumps in the upper part of the motor, if the motor cooling cycle is not installed, the entire motor is immersed in water to cool the motor stator. 3. 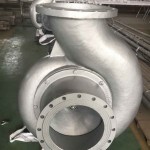 The minimum submerged depth is to ensure that the pump running, the sink does not occur in the whirlpool, the air is not involved in the import of the pump, and to ensure that the liquid flow into the pump evenly distributed. Moreover, Nanjing lanshen Pump Corp.LTD. found that some pumping stations due to the flow and inhalation pool conditions are limited, the pump running after the change in the water level is very large, inhalation tank water level, resulting in the actual submerged depth below the minimum submerged depth, resulting in the pump can not run properly, Cavitation. 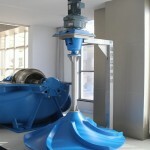 Such as a pumping station, suction pool minimum water level elevation of 1m, up to 4.5m, water depth difference of 3.5m. If the pump station is designed according to the 1m elevation, the whole pumping station is dug deep and the elevation design is raised. The submerged depth is less than the minimum submerged depth.